I am so pleased to have found this lovely Linky by ‘What Katy Said’ and ‘Quite Frankly She Said’ called Happy Days. The idea of this linky is to inspire others to make the best out of every day, to see the happy in the little things. As no matter what, there is always something good in every single day- we just need to take the time to see it. I think its great to remember the happy moments, as I know that I am not very good at this, I tend to focus on the moments that didn’t go very well. So, I will be taking part in this every week, to make me appreciate and remember the happy moments. After writing yesterday’s post about a lonely world, it feels good to be writing about the happy times that we did have this week. Let’s focus on the happy times! This week has felt long, why does a four day week, feel longer than a five day week? Seeing my niece and sister in law, due to various sickness bugs we haven’t seen them for what seems likes forever. A lovely trip to the cafe and then to the park, was perfect. Seeing the three girls all together playing and laughing really is the best! 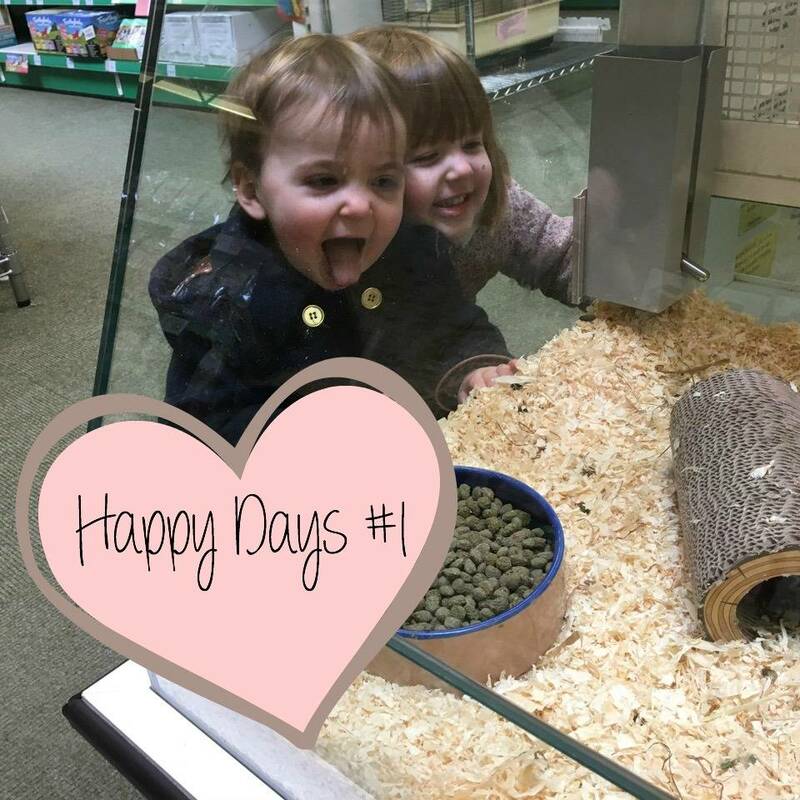 Taking the girls to the pet shop and seeing how happy they were to see the animals, don’t you just love free children entertainment! Holly has become very dependent on me, which isn’t surprising seeing as we have spent every day together for the last nineteen months. Andy’s mum has been itching to have Holly to look after and so, we decided that it would be lovely for Holly to spend some time with grandma. She has been going for the last couple of Wednesday’s and for the first this week, she didn’t cry when I left her. This makes me happy, because even though I know she was happy the minute I left, its never easy to walk away from your crying daughter. Andy being off work on yesterday, was lovely and we got to have a lovely family day out, just the four of us. I love these days, it makes me remember that through all the tough parts of being a mummy to two, it really is worth it. Wow, it felt good to think about the happy moments of our week…I will be back next week! This is a great link up isn’t it? My girls love the pet shop, at our old house we had a big one that was a 10 minute walk away and I was always taking them for something to do! I saw Alice’s bunny outfit and I thought it was fabulous! The best dressed bunny I’ve ever seen I think. Looks like you guys had a good week~ Great to see you got to have a little gathering with the family too!